Frame: of the period, possibly the original, and is in excellent condition. Details: Henry Raeburn was one of the most prominent of the Scottish portraitists, coming into his own in the 1790s when his style was much appreciated by the Scottish intellectuals. His treatment of male sitters was enhanced by the use of strong shadows and dark backgrounds. He favoured expressions of noble thoughtfulness or intensity of purpose, as in this portrait, which also displays the directness that has been called “the portraiture of common sense”. However, although the work, dating from circa 1810, is close to Raeburn’s style and standard, it does not have a direct link to the artist, and thus is only attributed to his circle. Neverthless, the provenance is well documented; it originates in the Elphinstone Family Trust, which disposed of some 50 family portraits at Sotheby’s in 2006. 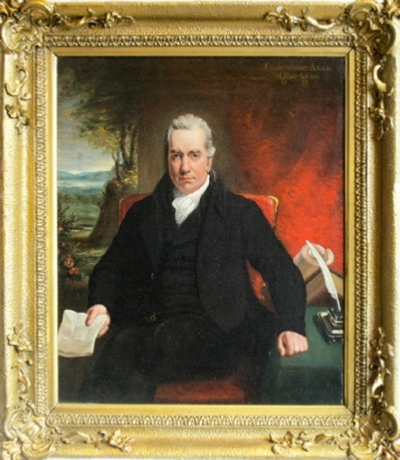 The sitter is William Adam QC (1751-1839), a prominent politician both in England and Scotland, and Lord Chief Commissioner of the Scottish Jury Court. The son of John Adam, an architect, of Maryburgh, Kinross, he was also the nephew of the very famous architect, Robert Adam (1728-1792). He became a lawyer and was called to the Scottish Bar in 1773, but before commencing practice he became Independent MP for Gatton in Surrey, and in the course of a political career of some 40 years represented no fewer than 6 constituencies – Gatton, Wigton, Elgin, Rosshire, Kincardineshire and Kinross. He subsequently became a firm supporter of the Tory Lord North, and early on clashed violently and literally with Charles James Fox, the Whig Leader. They fought a famous pistol duel in Hyde Park on November 29th 1779, and Fox was slightly wounded. When the events surrounding the French Revolution isolated Fox in parliament, Adam became one of his most fervent supporters. During his parliamentary career Adam held various posts. He was Treasurer of the Ordnance 1780-1783. As one of the managers of the Impeachment of Warren Hastings, he opened the second charge against him in 1788. He became a Privy Councillor in 1815 and Lord High Commissioner of the Scottish Jury Court in 1816. Other posts held included Attorney General to the Prince of Wales, Lord Lieutenant of Kinrosshire, Counsellor of State to the Prince Regent in Scotland and Counsel to the East India Company. He was an intimate friend of Sir Walter Scott. In 1776 he married Eleanora, daughter of the tenth Lord Elphinstone, hence the portrait’s link to the Elphinstone Trust. They had four sons, all of whom had very successful careers. The eldest, John, became acting Governor-General of India. The second, Admiral Sir Charles Adam KCB served with distinction during the Napoleonic wars and became one of the Lords of the Admiralty. He ended his career as Governor of Greenwich Hospital, where he died in 1853. His bust can be seen to this day in the Painted Hall. The third son, William, was auditor to the Duke of Bedford. The fourth, General Sir Frederick Adam K.C.M.G. G.C.B (1781-1853) was perhaps the most successful, fighting as a Brigadier General under the Duke of Wellington in Spain and, as a Major General, commanding a brigade at Waterloo. His brigade of the 52nd, 71st and 95th regiments was on the English right and at the critical moment of the battle carried out the unexpected flank attack on the French Imperial Old Guard which broke the formation of the second half. For his services that day Adam was appointed K.C.B., a Knight of the Order of Maria Theresa and a Knight of St Andrew of Russia. Later he became Lord High Commissioner of the Ionian Isles, the Governor of Madras, a Privy Councillor and Colonel of the 57th Regiment. He dropped dead at Greenwich railway station when visiting his brother Sir Charles. A most interesting family. The portrait is within a frame of the period, possibly the original, and is in excellent condition.